Our Sunday morning began at Holleshof, a small playground and corn maze that opened a number of years ago on land owned by the Waerdt family. The place came to the attention of enthusiasts worldwide in 2017, when a homemade roller coaster made an unexpected appearance on RCDB. Though officially restricted to those of 40kg of less it was clear from Coaster-Count that a good number of (technically) mature enthusiasts had managed to ride, and on that basis that we decided it was worth calling by to check it out ourselves. Loren-Express (#2540) is an oval-shaped roller coaster with a height differential of around five feet. Passengers climb into a decorated storage bin with wheel bogies and an extremely noisy anti-rollback device that (despite appearances) is large enough to seat most adults. The layout has two hills, the first leading to some side-to-side undulations, and the second leading to some tiny airtime bumps. Passengers drag themselves to each apex by pulling on a rope located to the right of the track, and the process requires considerable effort; I thought at first that my weight was making things difficult, but then I realised that lighter people would have far less pulling power, making it equally challenging for all. The ride is brief, but fun; were I ten years old again I'd likely have gone round several times. De Valkenier is home to the third-oldest roller coaster in the Netherlands, a large format Zierer Tivoli that for thirty-seven years was known as Achtbaan. In its formative years it sported bright red track, though much of the colour has faded over the intervening decades even as the ride area filled out with vegetation. Management decided to give the train and station an overhaul for this season, resulting in Green Snake. The fiberglass ladybird face on the front car doesn't quite work in green and yellow, so the artists have gone for the old reliable technique of writing the word "snake" underneath for the benefit of those who can't figure out the species for themselves. We rode in the back seat, which was fine if undistinguished. Our second stop was at the Spook Kasteel. My trip report from 2007 refers to skeletons and overcooked pizza, though the latter was nowhere in sight today, suggesting that some renovation work has taken place over the intervening years. The ride began with two sets of doors to keep the light out, followed almost immediately by a skeleton practicing its yoga moves on a bright green background. Several zombies followed, one lit by a strobe light and another holding a torch that shone right in our faces. A horror rising slowly out of a box came next, followed by the highlight: a performance from an animatronic skeleton band, comprising a piano, a guitar, a trumpet, and drums. The ride lasted about seventy seconds from start to finish. My final hit was the Reuzenrad wheel, a twelve car model with cars shaped to look like UFOs. Megan also decided to do the Maanraket, a simulator ride built into a rocket-shaped tube with an exceptionally arthritic lifting system at one end. I'm told that the film inside was a clip from one of the Star Wars movies which gained very little from being shown on a slight incline. Kinderstad Heerlen is a substantial family entertainment center located in the south-eastern corner of the Netherlands, about twenty kilometres away from Maastricht. 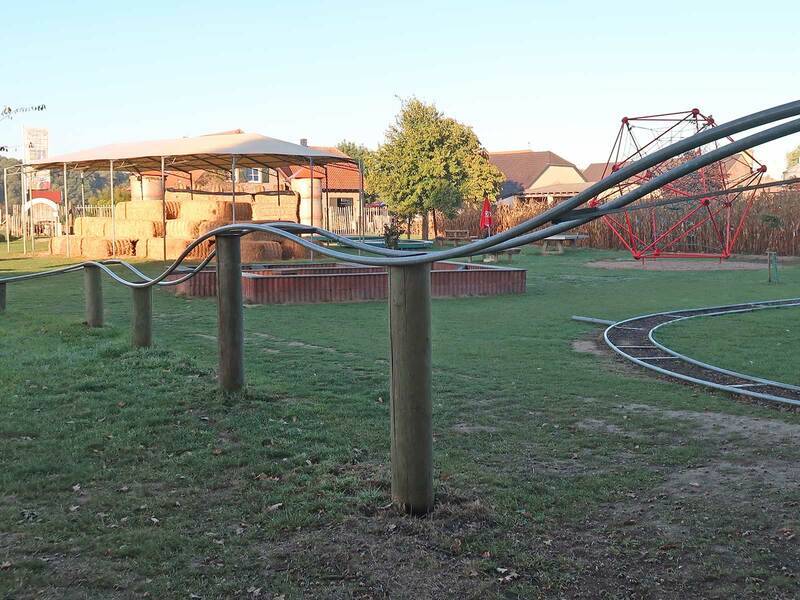 A selection of playground equipment and a number of family rides have been installed in a ten thousand square metre oblong shed that almost certainly began life as a train maintenance workshop; fifteen separate tracks run parallel to the building, and a main line station is located a short walk from the entrance. Management decided to replace the original Achtbaan with something bigger, and settled on a 30x14 Family Coaster from Preston & Barbieri. The standard model ride fit into the building without modifications, though the installation team had to improvise a replacement roof support due to the original being bisected by the first drop. The resulting square frame looks a little unusual, though one doubts that the average eight year old patron cares very much. 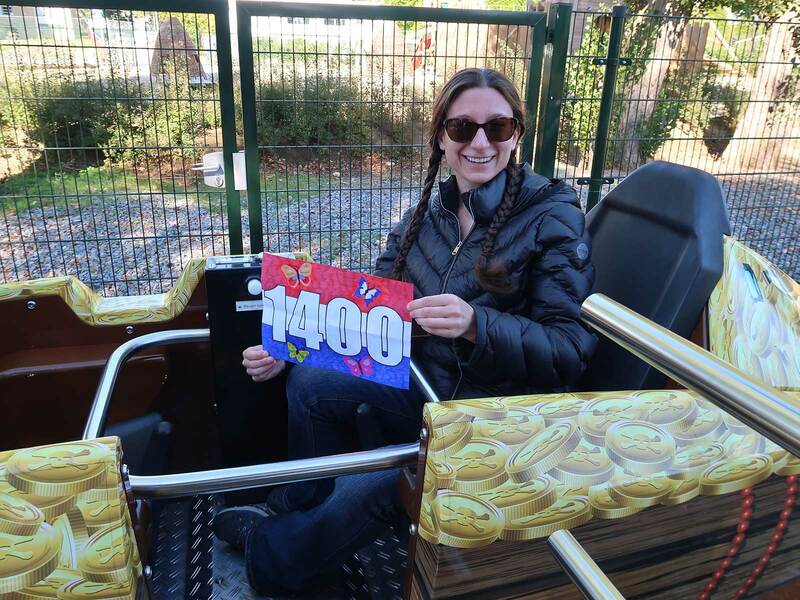 The new Achtbaan (#2542) is a respectable coaster suitable for all ages, and though we only rode once in the back row we'd have happily gone around again had we not been competing against large numbers of children! 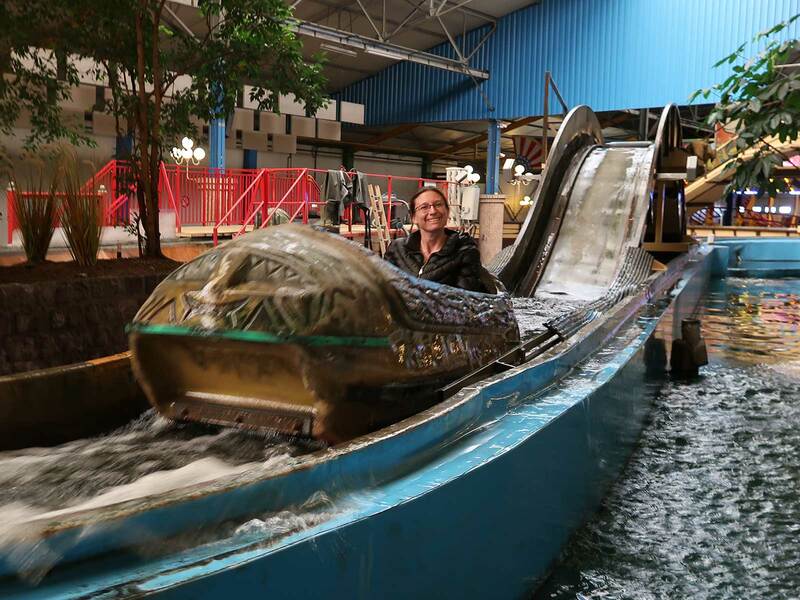 We also decided to try the Wildwaterbaan, a log flume ride that today was running in full automatic mode. Sitting in the boat was enough to trigger a dispatch around the course, which featured two drops of around ten feet coupled with a minute or so of gentle floating. Though far from drenching the descents were more than a little damp, presumably due to our weights; adult visitors should definitely ride separately to avoid a soaking. When I first visited Toverland back in 2005 it was a family entertainment center that had put itself on the enthusiast map by installing the world's first Vekoma Motorbike Coaster. Virtually all of the other attractions at the time were installed in a pair of climate controlled warehouses, and most were geared towards young children. An enormous wood coaster added in 2007 seemed like a strange choice given the park's clientele, but in hindsight it was arguably a statement of intent, reinforced a few years later with the addition of the Magische Vallei. This year has seen a €35 million investment, by some margin the largest in the park's history, which has paid for a new themed area, two major new rides, and a new entrance. The reader might consider the latter to be window dressing, but I'd argue that it is anything but; visitors now enter the park adjacent to Troy rather than through a room full of children's rides, reflecting a facility that has come of age, and which deserves to be thought of as one of the top theme parks in mainland Europe. The ride starts with a chain lift and a right turn that rolls into an inversion for the first drop. A powerful airtime hill comes next, followed in short order by a swooping descent underneath a pedestrian footbridge. An Immelman inversion goes over that same bridge, allowing observers to stand right in the middle of the action. The remainder of the layout comprises a right turning helix, a zero gravity roll, another dive under a bridge, then a few turns back to the brake run. The ride is one of the shorter wing coasters, with 813 metres of track negotiated in around forty seconds from top of lift to brake, but it is thrilling and eminently satisfying journey that is quite a bit more forceful than the norm for modern day Bolliger & Mabillard. We had two laps, one in the front left, the other in the back right, and I'd have liked about ten more. It was here that we ran into a bunch of local enthusiasts, who joined us for a courtesy lap on Dwervelwind. The queue was short, and the ride was fine if unmemorable, as our car didn't spin very much. Some of our new friends headed back towards Fénix afterwards, though a few agreed to join us for a front seat on Troy. We also ran into Maijkel here, a fellow enthusiast I'd last seen some fifteen years earlier in Spain. The ride quality was far better than I remembered from previous visits, though the experience was rendered somewhat challenging due to an onslaught of flies. These first made their presence felt at the apex of the lift, and continued their bombardment throughout the entire course. I was glad to have glasses on; several of the wretched creatures met their end on my lenses. Some years ago I made the mistake of assuming that a three hour drive to Frankfurt Airport would be achievable in three hours on a Sunday evening, and came perilously close to missing a flight as a result. Nowadays I like to be in the general vicinity of the airport with plenty of time to spare. 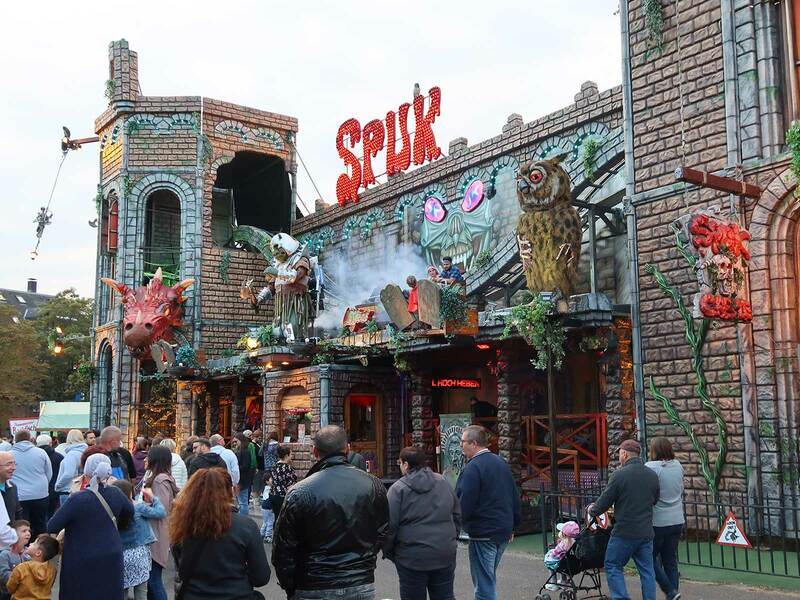 Today that meant a visit to the Krefeld Sprödentalkirmes, located around twenty minutes by road from Dusseldorf Airport. There was a large car park adjacent to the entrance, making it a very straightforward hit. Our stop was planned around the presence of Racing Coaster (Hartmann) (#2544), a single helix ride from SBF that is probably the best looking example of the genre I've seen in my travels – not that one would expect anything less on a German fairground. There were a number of different themes represented on the backflash: people in lederhosen, the coasters of Coney Island (including both Cyclone and Thunderbolt), Disney's Cars, and for reasons unclear, White Castle. We took the back seat for at least twenty laps that were memorable chiefly for a distinctly uncomfortable sideways slam after the descending helix. For this we count coasters. Afterwards we made the mistake of renewing our acquaintance with Drifting Coaster (Ahrend). This was unequivocally awful. We were assigned to backwards facing seats, which made it impossible to anticipate the various directional changes, and that turned the experience into an ordeal. Some of the track transactions were embarrassingly bad, not least one which caused my head to hit the restraint despite there being several inches of clearance. Though the ride has a commanding visual presence it reminds me of the late Eurostar, in that it really should be retired (or at least significantly overhauled) before it causes serious injury. The last stop of the weekend was at Spuk (Sipkema/Lutjens), a ghost train with rotating two-car trains, live actors, fire effects, and two drops powered by gravity and momentum. The ride is listed on coaster-count under the undefined category, and that's arguably a bit harsh, as it is at least as much of a coaster as some of the entries that merit full coaster status. The layout begins with a spiral lift hill and a V-shaped drop and climb followed by a turnaround. 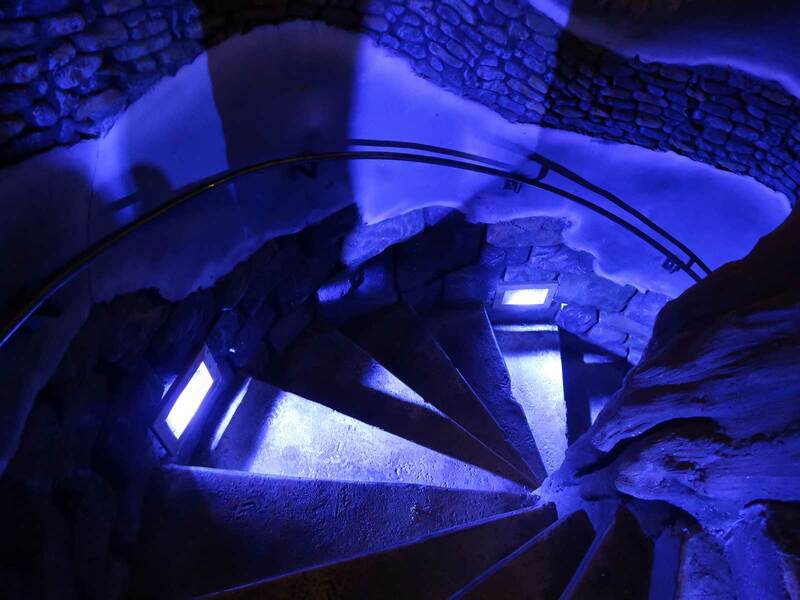 Riders then descend one floor at slow speed underneath the portrait of a demon, where they encounter an animatronic that brandishes a shovel in a not terribly menacing way. Slightly bemused riders are then treated to a flat outdoor section giving an overview of the fair. The car pushes back indoors past an indeterminate horror in a cage and into the second drop, which is memorable chiefly for a combination of dry ice smoke and strobe lighting. Thirty seconds of proper ghost train then concludes the experience.